Upgrade your expectations at Triple Creek! We are changing the way people think about homes in Piedmont! Greenville&apos;s newest 100% Financing Approved Community. Nestled in a serene landscape, but so close to all of the amenities that you love! Triple Creek is just minutes from I-85, Woodruff Rd, Augusta Rd, Downtown Greenville and Major Employers like GHS, Michelin and BMW! This spacious Ranch plan embodies open concept living at its best. 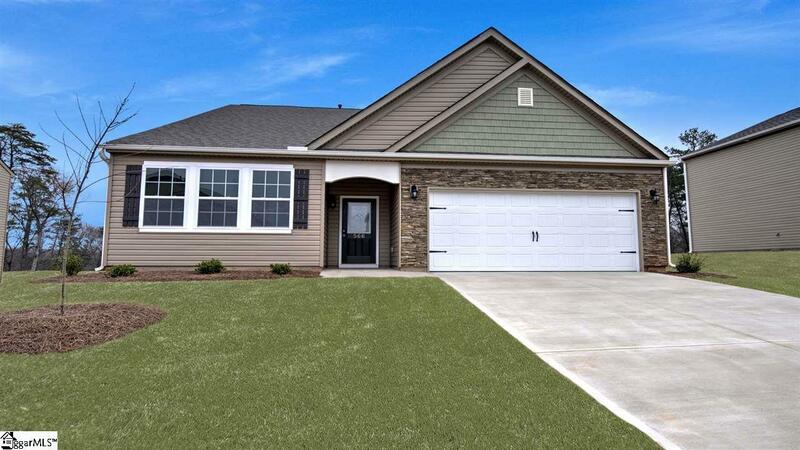 The Aberdeen is a 3 Bedroom, 2 Full Bath, 2 Car Garage with an open Family Room, Dining Room and Kitchen designed for entertaining! The Family Room features a Gas log Fireplace with built in HD link, allowing you to mount your TV above the fireplace without all the unsightly wires. The Kitchen features an expansive island, Frigidaire stainless steel appliances, including dishwasher, built in microwave, and gas range. The breakfast area next to the kitchen leads out to the Covered Patio for year round enjoyment. The Owner&apos;s Suite is incredible and features soaring vaulted ceilings, Deluxe Bath with dual vanity, walk-in shower and separate tub. Your walk-in closet can accommodate the largest of wardrobes. Two additional bedrooms are located in the front of the home and share the hallway bathroom. This home is complete with upgraded RevWood flooring in the foyer, living room, dining room, family room, kitchen, and breakfast nook and the Master!! Large Laundry Room. Come & See! This is an incredible value with all the benefits of new home construction with a 10 Year Home Warranty. Finance your new home with our preferred lender and we will pay up to 3% your closing costs & pre-paids!